The 2008 Chicago Air & Water Show roared into town today. Military and civilian aircraft from all over the country began arriving this morning at the Gary International Airport where most of them will be based throughout the airshow. Today at the airshow media day I had the opportunity to take a sneak peek at many of the acts, speak with some of the pilots, go for some rides and best of all fly the T-6 Texan! As I mentioned in one of my previous posts, one of the acts I am most excited about this year is Bill Leff's Night Airshow. 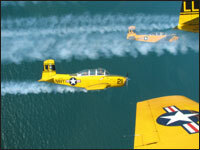 His T-6 Texan is specially equipped with pyrotechnics so he can put on a thrilling unique night time airshow experience. In meeting Bill I learned that he is from Dayton, Ohio. I shared with him that I learned to fly in the Cincinnati and Dayton areas. After learning I was a pilot, Bill offered to let me fly the T-6 Texan when we went for a flight. I had flown in a T-6 with the AeroShell team previously, though since they fly in tight formations there was no opportunity for me to fly. Shortly after getting airborne Bill told me the plane was mine. I flew us out to the practice area and performed a few turns and climbs. 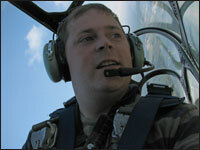 Once at the practice area he took over the aircraft to perform some aerobatics. We flew a variety of maneuvers but my favorites were the barrel roll and the loop. I love the power of the T-6! On the way back to Gary he gave me the plane back and had me fly us back until we were on short final where he took over the plane for landing. I had a great time talking to Bill and flying with him and am really looking forward to watching him perform on Friday night. If you are in the Chicago Area stop by the lakefront tomorrow night to see him perform. As we parked the plane the Lima Lima Flight Team returned from a press flight. Sitting in the back seat of the lead plane was Florence Henderson (AKA Carol Brady from the Brady Bunch). Henderson will be singing the national anthem each day of the airshow. She was kind enough to take a photo with me (Available in slideshow below). While standing there I learned there was a spare seat in one of Lima Lima's T-34s for their next sortie, so I jumped on that. Rick "Knuckles" Nichols took great care of me and gave a very enjoyable flight. We were in the seventh plane in an eight plane formation. During they show they will perform as a six-plane team, Nichols will serve as the team announcer during the show. Be sure not to miss Lima Lima's performances this weekend. Throughout the day the Blue Angels were coming and going to do spot checks and practice flights over Chicago. I did not get to see a preview of their Chicago Show but did enjoy seeing a few maneuvers back at Gary. I guess it gives me something to look forward to during the next few days. So awesome! I love all your Blue Angels shots. I'm going to see them in November with a bunch of Astronauts. Can't wait! Great shots!! Can´t await my next air show attendance. I just downloaded some pics for personal purposes, hope you don´t mind!